1927 Babe Ruth Game Used Record Sixtieth Home Run Bat Gifted to Legendary Performer and Collector Joe E. Brown, PSA/DNA GU 10. It has been 117 years since the franchise that would become the New York Yankees took its first breath, just a few miles and six years removed from the place and time where an infant who would become Babe Ruth took his own. By 1903, the Baltimore Orioles had become the New York Highlanders, and then, after another decade and its relocation to the famous Polo Grounds, the team was officially rechristened with the name that appears on all twenty-seven versions of its World Championship hardware. It is no revelation to pronounce the expensive arrival of that boy from Baltimore as the primary catalyst for the Yankees' rebranding as the gold standard of American sport, a theme that endures as we edge toward the centennial of Ruth's acquisition from the Boston Red Sox. Since that 1920 transaction, no decade of Yankees history but the 1980's has ended without at least two celebrations of Fall Classic glory. It's a chart of far more peaks than valleys. The highlight reel of timeless moments is a feature-length film at this point, the cast of Hall of Fame immortals large enough to fill a city bus. But if we were to survey the entirety of that range to locate the Everest of Yankee greatness, that highest peak of the franchise Himalayas, the offered relic might well be the marker we'd find there. First, let's acknowledge the obvious. Ruth's sixty home runs in 1927 is no longer the record. Maris has long since shed his asterisk, and the millennial power surge either clarified or muddied the waters depending on one's personal standards for fair play. But context is everything, and clearly there are oceans separating the various Home Run Kingdoms. That being said, we feel no compulsion to beat baseball's deadest horse. Roger Maris was a man of his age. Mark McGwire and Barry Bonds were men of their own. Babe Ruth, however, was unquestionably something different, a full paradigm shift, the prime resuscitating force that closed out a half century of the Dead Ball Era. His sixty home runs in 1927, a thrilling improvement of his own towering record, could quite properly be identified as Ruth's greatest masterpiece. The team to which he supplied that unprecedented offensive onslaught likewise stands alone atop the ranking of nearly every baseball historian, an unstoppable force immortalized with the homicidal nickname of "Murderer's Row." That killer crew would send the Pittsburgh Pirate ship to Davy Jones' Locker that year in a merciful four-game Fall Classic sweep, the conclusion coming just eight days after Ruth raised his storied record. That second World Series Championship in franchise history was a glorious achievement, to be sure, but we'd consider it somewhat of an anticlimax after September 30, 1927, when the Babe made it an even five dozen. We are extraordinarily proud and privileged to present to the collecting community the bat with which Babe Ruth struck his fabled sixtieth. It is essential that we disclose the fact that the Baseball Hall of Fame-an establishment for which we hold the utmost respect--claims to own the bat responsible for that monumental feat. But the detailed letter of examination from leading expert John Taube of PSA/DNA carefully compares and contrasts the divergent tales of provenance, leaving little doubt that the Cooperstown example is improperly identified. Both bats can be definitively assigned a 1927 vintage, the offered hickory model, measuring just under thirty-five and a half inches (35.375") and thirty-nine ounces (38.8 oz. ), delivered to Ruth as part of a Hillerich & Bradsby order placed between May 14 and September 27 of that year. The outstanding game use evident here suggests the bat served a lengthy tenure in the hands of the game's foremost slugger, with multiple ball marks and stitch impressions on the left barrel, matching Ruth's label-down, left-handed swing. Green rack streaks decorate the barrel and handle. The right barrel is inscribed in black fountain pen ink "To Joe E. Brown From Babe Ruth." 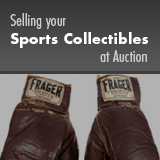 That name will be familiar to most veteran hobbyists, as Brown was a famous and much beloved comedian and movie star widely regarded as the first celebrity sports memorabilia collector. Brown nearly had a Major League career of his own, but traded the diamond for vaudeville and the silver screen after a broken leg hobbled his chances for athletic glory. His collection included uniforms from Cobb, Wagner, Speaker and Foxx, and the bat with which Babe Ruth clubbed his three home runs for an ailing Johnny Sylvester in the 1926 World Series, though tragically most of that collection was lost in the 1961 Los Angeles wildfires. Bill Mazeroski's most famous long ball saved this relic from that scorched fate, as Brown had gifted to it his son, Pittsburgh Pirates general manager Joe L. Brown, in celebration of his team's 1960 World Championship. A notarized 2012 letter from Don E. Brown-son of Joe L. and grandson of Joe E.-discusses the history of the collection, and of this bat in particular. The Babe's established friendship with Brown, and the documented history of presenting him with a bat of supreme significance (the 1926 Johnny Sylvester gamer), serve as a convincing validation of the younger Brown's sworn affidavit. The bat is also referenced in a pair of included (copies) news articles. The June 23, 1941 edition of "The Montreal Gazette" article entitled "Joe E Brown Trophies, Ball Museum Pieces" identifies his ownership of "the bat used by Babe Ruth...when he set the still unbroken record of 60 home runs," mistakenly listing the vintage as 1931. The December 1948 edition of "The Sporting News" supplies the first acknowledgment of the competing narratives in an article entitled, "Controversy Over Historic Ruth Bat," documenting Brown's public comments to a banquet crowd which contained the source of the other purported example, "New York Sun" baseball writer Jim Kahn. Kahn was quoted to respond, "I have no wish to start a controversy, but I want to state that the bat which is now on exhibition in the Baseball Museum was given to me by Babe after he hit his sixtieth home run." This statement by Kahn is one of several points of concern. An included copy of a June 1939 article from "The Otsego Farmer," the local paper for Cooperstown, discusses Kahn's gift to the Hall of Fame, noting, "Mr. Kahn was then, as now, a baseball writer traveling with the Yankees, and the bat was given to him by Miller Huggins." While some might dismiss the inconsistent reporting of the identity of the presenter of the bat to Kahn, the suggestion that Ruth would have parted with the bat with one last regular season game and the World Series still ahead--or that he would have made a lowly sportswriter the beneficiary of such a monumental treasure--certainly strains credulity. The Babe was fiercely protective of his historic bats, and there is nothing in the public record to suggest that his relationship with Kahn was anything more than casual, in sharp contrast to his close friendship with Brown. Furthermore, Ruth had a long-established record of presenting historic home run bats to personal friends and dignitaries, always personalizing them to the recipient above his signature. The Brown bat is personalized, while the Kahn bat is not. Taube likewise references a tale recounted in Robert Creamer's definitive Ruth biography, "Babe: The Legend Comes to Life," about Ruth's staggering late-season hot streak-seventeen home runs in September. Eight days before he broke the record, the superstitious slugger walked it off against the Tigers with a two-run blast in the bottom of the ninth-number fifty-seven on September 22nd--and ran the bases carrying his bat out of fear that one of the celebrating fans storming the field might make off with it as a souvenir. So would he have simply given away the best bat of them all a week later, before the season was over? All logic would suggest otherwise. We invite you to study the evidence yourself-the full dossier will be made available for review at our online lot listing-and make your own determination. We expect most, if not all, will reach the conclusion shared by the experts at PSA/DNA and Heritage Auctions-that this offering is the one and only authentic 1927 Babe Ruth 60th home run bat, and thus one of the most significant articles of sports memorabilia ever to cross the hobby's auction block. LOA from PSA/DNA, GU 10. Full LOA from PSA/DNA (autograph). Full LOA from James Spence Authentication (autograph).